FINNEGAN Wants to Begin Again. This time he wants a loving, forever family. He was an unclaimed stray at Jessamine County Shelter in KY. A gentle soul with soft eyes. 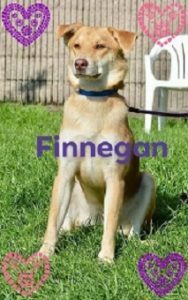 FINNEGAN is a Shepherd/Lab type with beautiful beige & auburn fur. He is about 2 yr old, 47 lb, full grown and played well with 2 female dogs at the KY shelter. FINNEGAN has Family Dog Potential & would love to begin again with YOU.